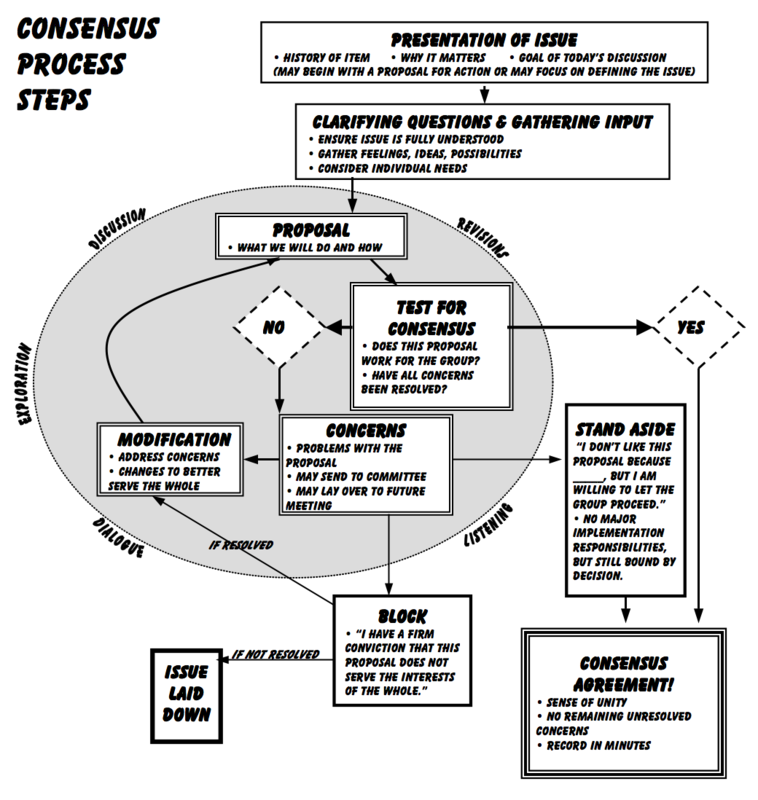 For those needed a refresher on the consensus process, here is a wonderful explanation of the process provided by professional facilitator Tree Bressen. Consensus is a cooperative process in which group members develop and agree to support a decision in the best interest of the whole. Search together for the best solution for the group: it's "us against the problem" we are trying to solve rather than "us against each other"
"Everyone has a piece of the truth"
Meetings should be fulfilling—if they're not, then ask why, and change it! preparation: agenda planning, facilitator prep, bringing materials, etc. Ask: "Are there any remaining unresolved concerns?" Standard of how much agreement is enough may vary (depending on group and item)—how much agreement is sufficient to achieve solid implementation of this proposal? May range from "This is fabulous" to "I can live with it for now"
personal impact or need, e.g. "I can't afford this" or "I'd have to move out"
How many is too many? Probably more than 1 (or at most 2). The more you allow, the more it's like voting; go too far and you lose the extra effectiveness of consensus action. Tree Bressen, facilitator and teacher, has been assisting intentional communities, nonprofits, and other organizations with group process since 1994. Pages from her website are available for copying and distribution free of charge as long as you continue to include these credit lines and contact information.